Blog Pumpkin Apple Breakfast "Cake"
Okay, okay. So this isn’t your typical cake. It’s kind of a cross between a pudding and a cake. 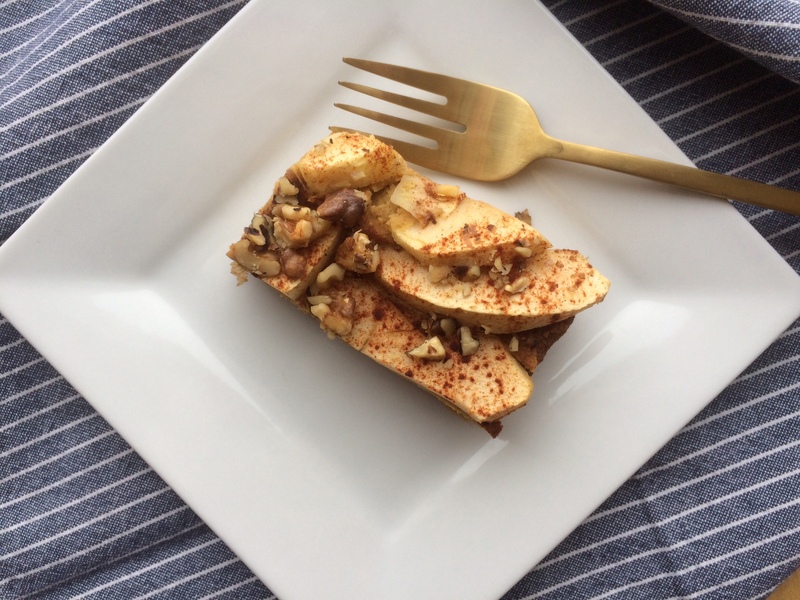 It’s yummy, high in protein, and Whole30 compliant. Two days in to Whole30, and I was craving something bready. Gluten was disappearing from our table, but we hadn’t completely eliminated grain. 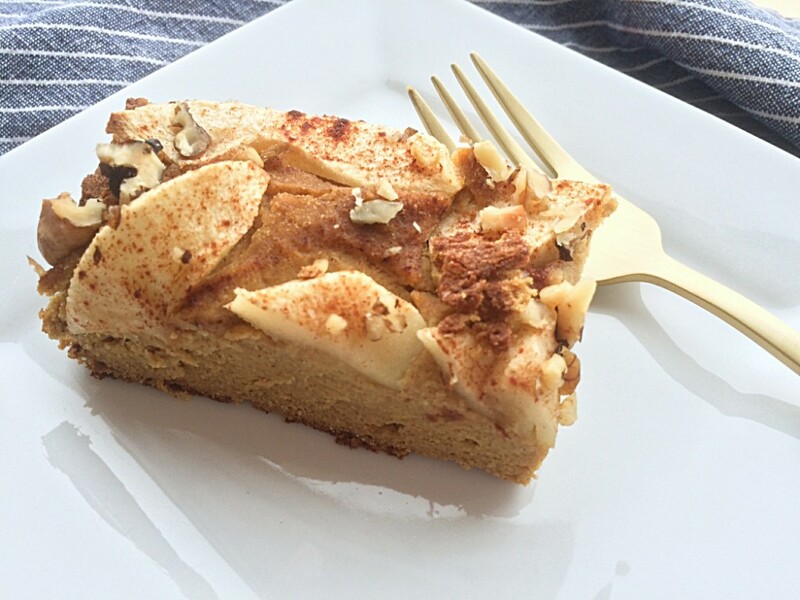 I created this Pumpkin Apple Breakfast “Cake” recipe to satisfy that craving. I am still learning what is whole30 compliant and what isn’t. I know all of these ingredients are approved, so I’m going with it. 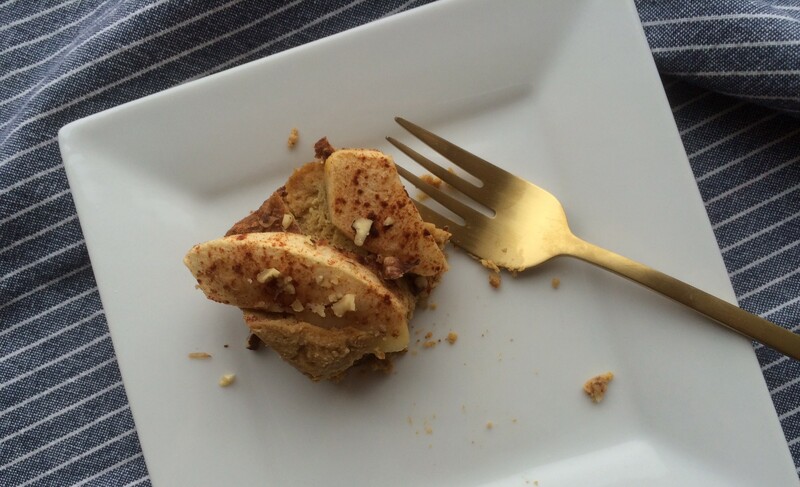 This is adapted from the excellent cookbook Nourishing Meals; Coconut Banana Breakfast Cake. No bananas on hand, I brought out the frozen homemade sweet squash puree I made this summer from our garden squash. But I think canned pumpkin puree will work also. The results are worthy of sharing with fellow Whole30-ers and their families. 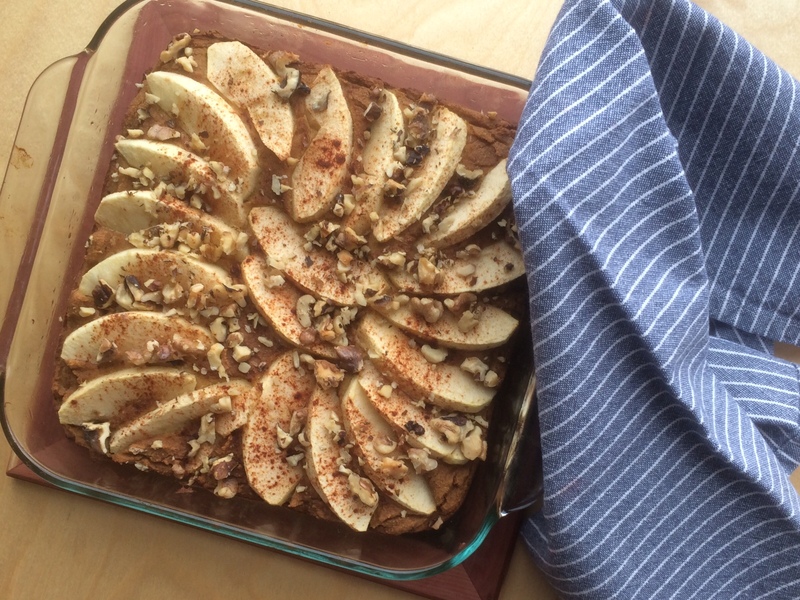 Also, if you are gluten, dairy, and grain free this is a good one to have in your repertoire. Family members not on Whole30 may have the options to top or not to top with something sweet (honey or maple syrup) and butter. For me, it’s good as is. It satisfies because it’s high in protein and mildly sweet. It’s good right out of the oven ( well, that is after you let it cool a bit) but it’s almost better the next day. It’s more moist and the flavors have had a chance to meld. Don’t restrict it to morning eats, as it would make a good protein boost after school for you and the kids. Ditch the fork, grab a napkin and have a moment of yum! Enjoy! Here’s an update on my Whole30 experience 1 week in. Please comment about your experiences on Whole30. 1) I am surprised at how satisfied I am after every meal, not needing a second helping. I’m reading about the science of satiety in the book, It Starts With Food (Hartwig), and it’s playing out in real life for me. 2) Even though my plate is full of good food, my weight is stable, if not going down. 3) A week in and my sleep patterns are still on and off. I am hopeful for this to change with time but I will keep you posted. 4) I’m curious to see if there will be any impact on my workout. So far I’m not noticing any improvement in strength or endurance. 5) After enjoying a plant based diet (with small amounts of fish and chicken) for many decades, transitioning into an animal protein based diet is an adjustment. We are finding less is more for us when it comes to meat consumption. Bring on the veggies with a little animal protein on the side. 6) Body functions are still trying to figure out whats hit them. In spite of that I’m feeling really well. Preheat oven to 350 degrees. Grease an 8×8 Pyrex pan with coconut oil. 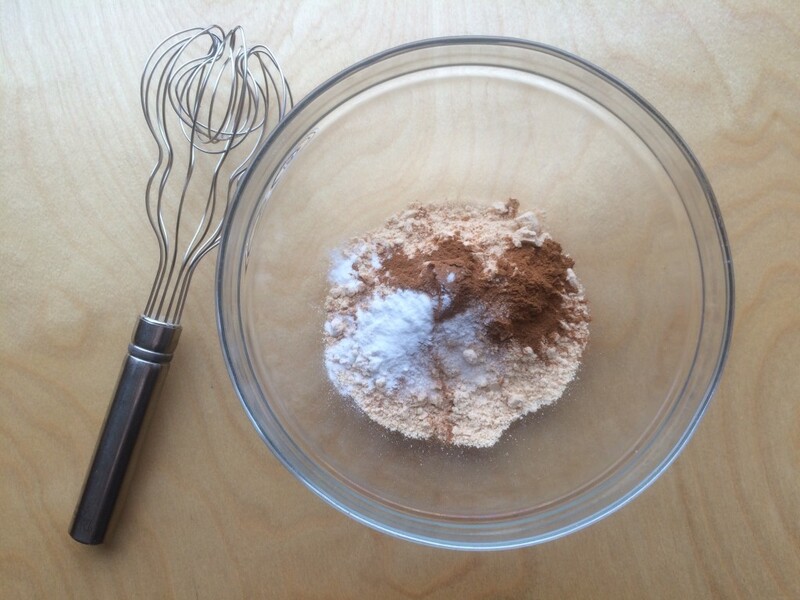 In a medium bowl, whisk together coconut flour, baking soda, sea salt and cinnamon. 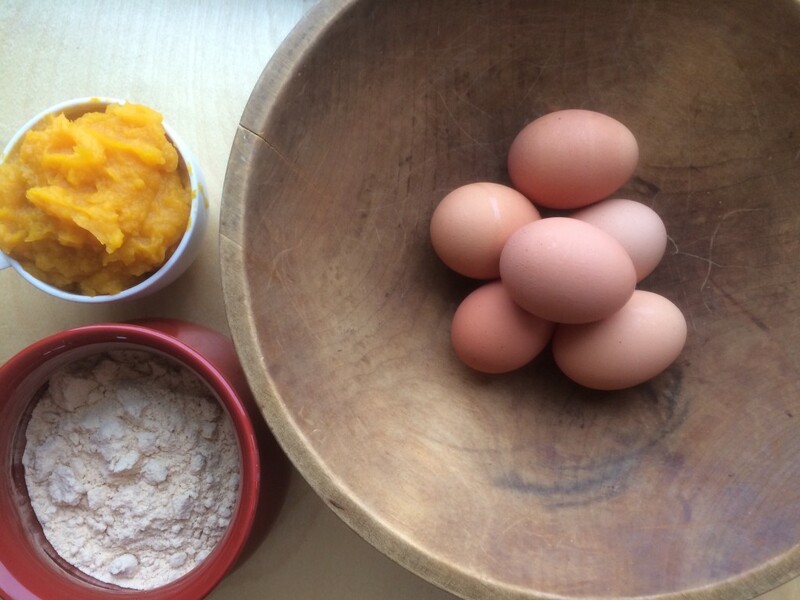 Place puree, melted coconut oil, applesauce and eggs in a blender. Blend until smooth and creamy. Pour the wet ingredients into the dry ingredients and whisk together until combined. In a medium size bowl, toss sliced apples with lemon juice. 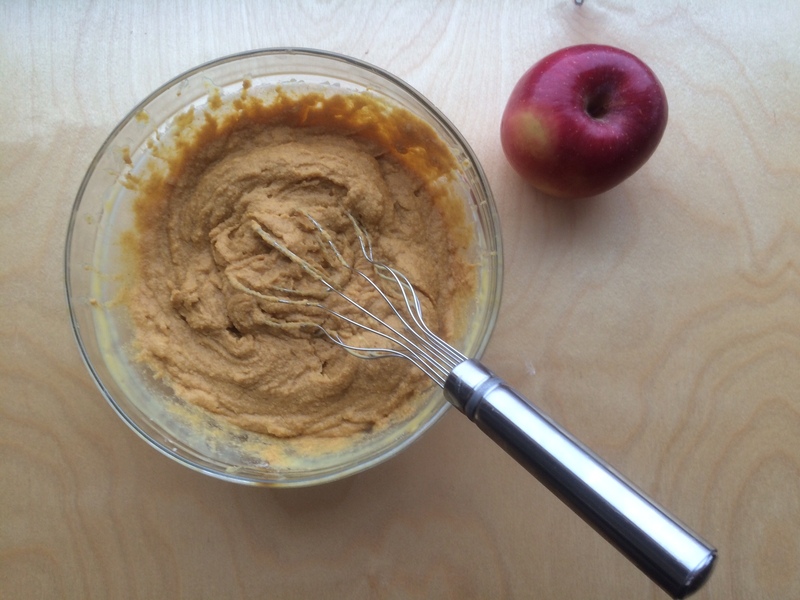 Arrange apples on top of batter, and press them into the batter so that some of the apple is in the batter. Sprinkle with cinnamon and chopped walnuts, if using. Bake approximately for 40-45 minutes. Let cool for 10 minutes. Serve warm or at room temperature. Hi Amy – I have read and “red-pinned” It Starts With Food and wholeheartedly recommend it to anyone interested in mind, food & body connections. I challenged my husband to let me adopt this for the 30 days in October 2014. I was actually surprised when he said yes. So we began. My 6’2″ guy weighed the most he had ever weighed – 226.5. I used some recipes in back of the It Starts With Food and tapped into pinterest, started a plant-based culinary class, discovered “you” :), bought Plant Nutrition for Dummies and sstarted. Well, my husband just walked in my office, looking great and announced he weighs 195.5! We have since reduced the quantity of meat we eat pretty strongly, but we eat “some” and just move forward with what makes sense – whole grains, fresh fruits & veggies w/some official “no-no’s from whole 30 in strong modest moderation for special occassions. Me – I weighed 147/5’5” small frame in October and now weigh 125. We both agree on other pluses beyond the weight loss – better energy & outlook. Good luck! Debbie, Congrats on the awesome results from your Whole30 experience and lifestyle change. I love to hear stories of transformation like yours! Eating clean is such a big beautiful world of delicious, fresh and colorful with unending possibilities. And yes, we read the informative article on sugar too. Thanks for your feedback Debbie! One more mention – this weeks Spokesman/Tuesday/Live Well-Section 3 – see the article regarding the research so strongly coming to the forefront regarding the association with sugar and disease. Amy thank you for blogging about the Whole30 program. I love your recipes! You have inspired me and my husband to start this program beginning in February. You are an inspiration to me to cook more healthy. Thank you so much!! !